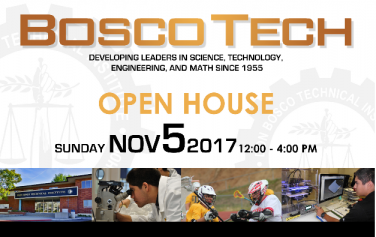 ROSEMEAD, Calif. - Oct. 17, 2017 - PRLog -- Don Bosco Technical Institute (Bosco Tech) will host its Open House for prospective students and their families on Sunday, November 5, 2017, from 12 noon to 4 pm. Interested middle school students are invited to tour the school's extensive engineering and applied science labs and participate in its signature Explore and Create workshops. Offered to boys in grades 6–8, these complementary sessions allow prospective students to experience Bosco Tech's uniquely integrated, hands-on STEM education. "The Explore and Create workshops are a great opportunity to try what Bosco Tech students actually do," said Principal Xavier Jimenez. "They offer a sample of the interactive technology curriculum the school is known for." Also during Open House, the school's athletic teams and clubs will provide information, while the award-winning Royal Techmen marching band will entertain the visiting crowds. A variety of foods will be available for purchase. For more information about Open House or the Explore & Create workshops, contact Director of Admissions John Garcia at jgarcia@boscotech.edu or 626-940-2009. Bosco Tech is an all-male Catholic high school that combines a rigorous college-preparatory program with a technology-focused education. The innovative curriculum allows students to exceed university admissions requirements while completing extensive integrated coursework in one of several applied science and engineering fields.The school boasts a four-year college acceptance rate of 100 percent and approximately 75 percent of Bosco Tech graduates have careers in STEM-related fields. Visit www.boscotech.edu or call 626-940-2000 for more information.